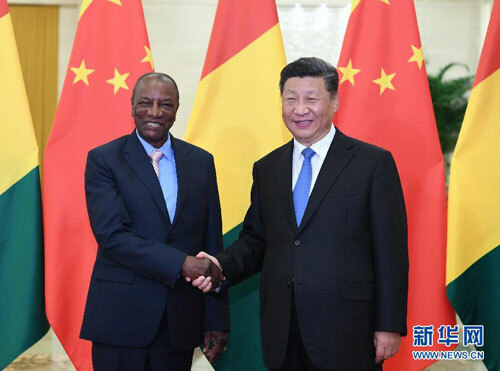 BEIJING, Sept. 1,Chinese President Xi Jinping on Saturday met with Guinean President Alpha Conde ahead of the 2018 Beijing Summit of the Forum on China-Africa Cooperation (FOCAC). Noting that Guinea was the first sub-Saharan African country to establish diplomatic relations with the People's Republic of China, Xi said the comprehensive strategic and cooperative partnership between the two countries developed rapidly in recent years. China cherishes the traditional friendship between the two countries and is willing to work with Guinea in the Belt and Road construction in a bid to deepen such friendship and turn it into fruitful cooperation, Xi said. The Chinese president also called on the two countries to maintain close communication and coordination on issues such as safeguarding multilateral trade system and peace and security in Africa, so as to protect the common interests of the two countries and all developing countries as well. Conde said next year will mark the 60th anniversary of the establishment of Guinea-China diplomatic ties. Guinea values its participation in the Belt and Road construction and hopes that the initiative could boost connectivity in energy and telecommunication, and contribute to the industrialization process of Africa. African countries speak highly of important concepts China put forward in international relations as well as its leading role, Conde added. The Guinean president also said he believed that the upcoming Beijing summit of FOCAC will be a big success and will elevate the Africa-China comprehensive strategic and cooperative partnership to a new level. After the meeting, the two presidents witnessed the signing of documents on bilateral cooperation.